Just today, it happened again: this time it was during a phone call with my mother. She mentioned that—thanks to my bad influence—my youngest niece is now an obsessive fan of Doctor Who. For Christmas, my brother’s teen-age daughter had hung a string of TARDIS lights in her bedroom—the strand draped so that it cast a smile-shaped shadow like a crack on the wall—and last week she spent an entire afternoon making Weeping Angel cookies. Needless to say, I couldn’t be prouder. But my mother—her grandmother—doesn’t get it: she’s watched a couple of episodes, and doesn’t see the appeal. “I get why she would like it,” my mother said to me. “I just don’t get why you do.” It was bafflement, not judgement, but the implication was clear: Doctor Who is not a show for grown-ups. The result is that the Christmas specials tend to be pitched bigger, sillier, and more family-friendly than the average episode of Doctor Who. (“It’s not a typical script,” previous head writer and showrunner Russell T. Davies wrote in his book The Writer’s Tale. “It has to be big and blousy and Christmas Day-y. It’s half script, half event.”) What this means is that even a fairly dark and mature holiday entry like Moffat’s “A Christmas Carol,” from 2010, is apt to have a lot of humor, a lot of spectacle, and the occasional flying, shark-drawn carriage ride. Every Christmas Day, I’m sure, passionate fans of the show find themselves sitting down nervously to watch the episode with non-initiated family members, cringing when the latter look up occasionally from their couches to say “What the hell are we watching?” And that’s okay: as much as I adore the darker and more sophisticated episodes, Doctor Who should never lose the children, and especially not on Christmas. Last year’s Narnia-inspired “The Doctor, the Widow, and the Wardrobe” was deeply silly—the kind of episode I would usually savage mercilessly in my reviews—but it was very “Christmas Day-y,” with trees that grow their own ornaments and magic presents that open into other worlds. I gave it a pass, and, to be honest, it’s kind of grown on me since. 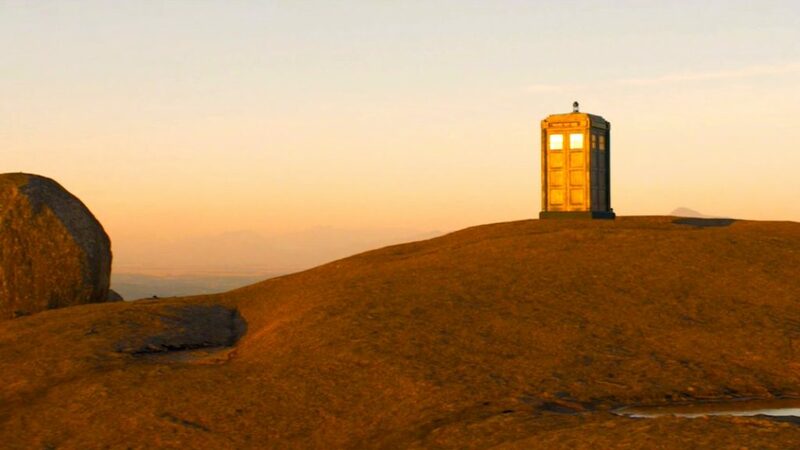 The beauty of Doctor Who, as I’ve always argued, is that it can tell any kind of story—and that includes, at least once a year, a holiday fairy tale that may leave the grown-ups rolling their eyes. All of which brings us back around to this year’s episode, “The Snowmen.” On first viewing, I have to admit, it struck me as another entertaining but fairly lightweight episode. Certainly it offered plenty of silliness, including some comedy with a memory-erasing worm, a spiral staircase to the clouds, and—of course—the titual killer snowmen from outer space. 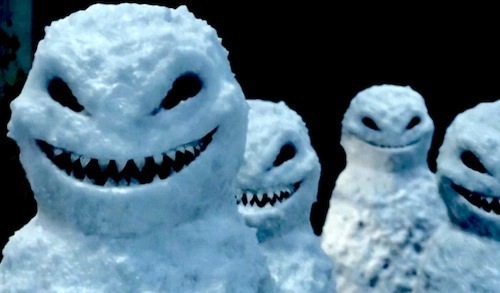 But it was on my second viewing that I realized “The Snowmen”—written by Moffat and directed by Saul Metzstein—is a little more complicated than that, and thematically far richer. And this brings me back to the question about why a grown man can spend so much time and energy thinking about Doctor Who: because it bears thinking about, because it rewards second and third viewings, because—like all great myths and fairy tales—it often operates on levels of which we’re not immediately aware. I’m not suggesting it is terribly profound or sophisticated, but the care with which Steven Moffat crafts his scripts—ensuring that even the silly Christmas runarounds are layered with metaphor and emotional depth—deserves some consideration. 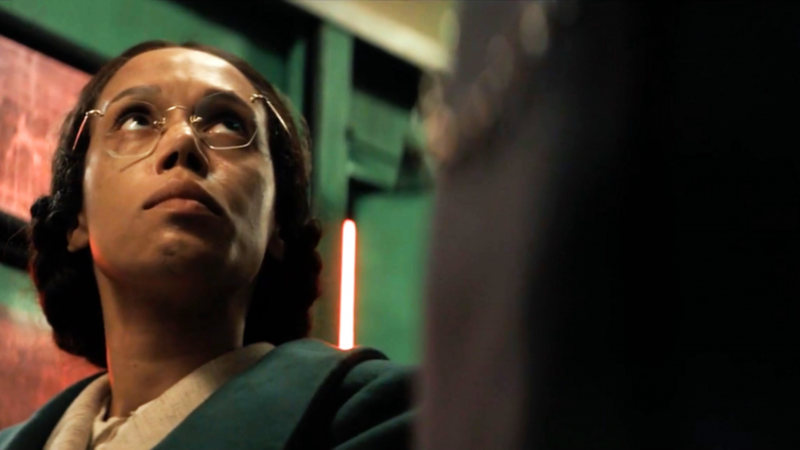 The word Clara chooses—“Man”—is significant, and earns an approving look from Vastra and Jenny. In my review of last season’s “A Good Man Goes to War,” I discussed the role that women play in the Doctor’s life: we can argue whether this is true in the classic series, but in the new series—and certainly since Moffat took over—the reason the Doctor’s companion is always female is not just to keep the letches like me watching. The Doctor needs a female companion to balance out his more masculine, aggressive tendencies, and to open up his compassionate, healing side. This is what Amy Pond did for the Doctor—and certainly there were times in their run together that he was as gentle and human as we’ve ever seen him—but now the loss of her has made him close himself off and stop caring about the world. Whether she knows it or not when she says it—and I think that’s one of those things that’s yet to be revealed—Clara’s next “one-word” message to the Doctor is the exact right appeal to his sequestered soul: Pond. I’ll belabor the point, because I think it’s worth belaboring: metaphorically, the Snow is the Doctor. He needs human beings (and specifically feminine influences) near him, around him, from whom he can learn: he needs their warmth and humanity reflected back at him, to learn from them and shape himself in their image. He needs them to evolve. Amy Pond was his soul, and here the “pond” is frozen over, trapping the humanity within it. 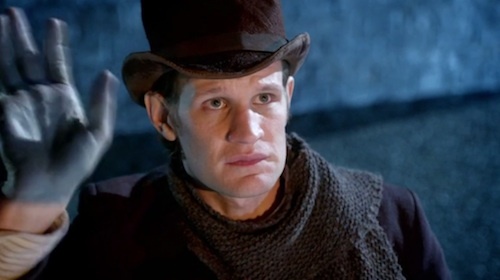 “You have to do better than that,” the Doctor tells the Snow. “You’ll have to evolve. You need to translate yourself into something more…well…human.” He doesn’t realize it, but he’s also speaking for himself. It is Clara, of course, who begins to thaw the Doctor’s heart, though he doesn’t know why himself. (“I never know why,” he says. “I only know who.”) The Doctor stands at the edge of the frozen pond, staring up at Clara in the window; he can’t help but wave back at her, and gives her a thumbs-up when he means to walk away. At that precise moment, the frozen surface of the pond—literally and figuratively—begins to crack. 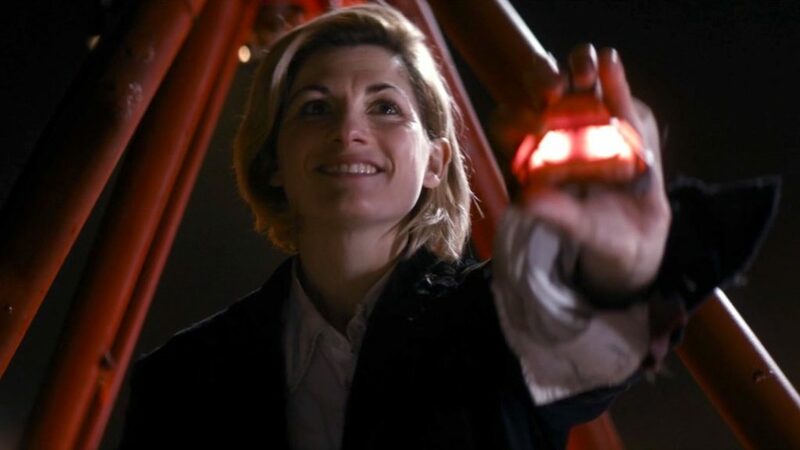 She can help the Doctor evolve, help him reclaim his—for lack of a better word—humanity, and let him reflect her own kindness and the vision she has of him. Immediately after, we see how she sees him: every companion has her own narrative of the Time Lord—for Amy he was the “Raggedy Doctor”—and here we hear Clara share hers with the children. “There is a man, called the Doctor. He lives on a cloud in the sky, and all he does all day, every day, is stop every child in the world from having bad dreams.” To her, the Doctor is a figure of protection, of kindness, and that’s the reflection of himself and his responsibilities that she can offer him. 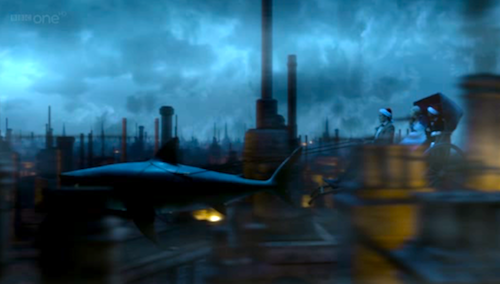 It is Clara who breaches his defenses, penetrates his ivory tower in the clouds where he has removed himself from humanity; when he invites her there again, late in the episode—to lead the governess, the frozen template of humanity, away from the Snow—we hear for the first time this episode Murray Gold’s 11th Doctor Theme, indicating that he’s back: the Doctor we know is back. He gives Clara the key to the TARDIS, the key to his heart. “What’s this?” she asks. “Me,” he says. “Giving in.” In caring about her, he’s thawed, and it is caring about Clara that thaws the evil snow as well, in one of those instances of cheesy deus ex machina that is only barely acceptable because it’s Christmas. 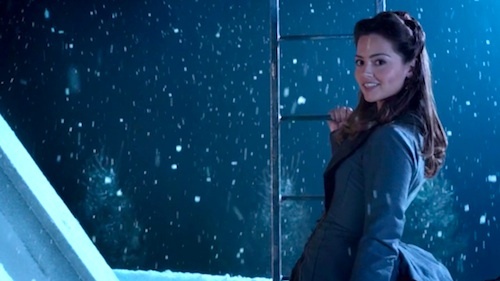 Clara falls back to earth, and dies, and—with the family mourning her death—the Snow mirrors their grief and turns to tears. Yes, it’s absurd and sappy as hell, but it’s also totally appropriate: she’s thawed the Doctor and the Snow, through the compassion she elicits and the humanity she inspires. “I regret to inform you the position is taken,” Clara says to the Icy Governess, but she may as well be speaking to Amy, to River, to Donna and Martha and Rose: the Doctor has a new companion, and the fact that she’s twice-dead just makes her all the more intriguing. “No more clouds,” he promises Clara on her deathbed, and the episode ends with him resuming his old ways, and taking off in the TARDIS, and heading off in search of the girl who is the new caretaker of his humanity. “Watch me run,” he says, to her, and to us. How could I leave without mentioning Strax (Dan Starkey), who does all the heavy lifting on the comic relief this episode? He’s a welcome bit of male energy to balance out my theory about the women in the Doctor’s life. 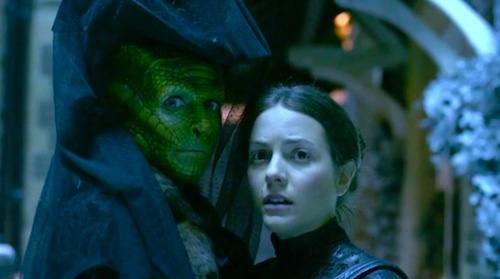 (His solution to problems involves “laser monkeys, scalpel grenades, and acid.”) Add my voice to those clamoring for a spin-off about the great Victorian detective Madame Vastra, her sword-wielding wife Jenny, and their loyal but bumbling butler Strax. 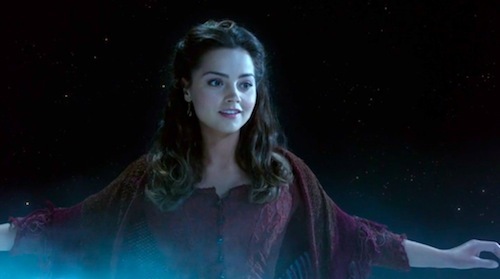 Keep an eye on Chekhov’s Memory Worm, which I suspect will play a part in the mystery of Oswin Oswald. I take the repeated proclamations that “winter is coming” to mean that Mr. Moffat is, like the rest of us, a huge Game of Thrones fan. We get a new title sequence, and a new TARDIS interior, both of them very retro: I like ’em, and they are very appropriate for the 50th anniversary year. Not so sure about the new arrangement of the theme music. I can’t say how much I love your reviews as much as I love the episodes themselves, I always look forward to here. You always make the Doctor Who episodes even more clever and enjoyable than I can already possibly think of. To say of this special, I really enjoy the script, and the vast amount of witty dialogue and cleverly planted plots. And amazed at Moffat’s skills, again.